Be a man, decorate for Christmas. It’s the most wonderful time of year. For me, I absolutely love it. Christmas time. As soon as the evening Thanksgiving meal is over it begins for me. Thanksgiving night, we watch National Lampoon’s Christmas Vacation and I instantly turn the switch on to embrace the Holiday spirit and anticipate the awesomeness of what is – Christmas. Now, while I do love Christmas, I do think it’s important to celebrate the Holiday that comes before it and is often lost in retail – in fact, I'm a firm believer “Fall” or “Thanksgiving” decorations will be reduced to a single aisle (if that) in the upcoming years. BUT, as of right now, today, it’s Christmas time. It started for me growing up. My grandparents on both sides of my parent's family enjoyed Christmas and it was always an annual event to visit my grandparents on my dad's side of the family Christmas Eve night and then my mom’s parents for Christmas lunch. 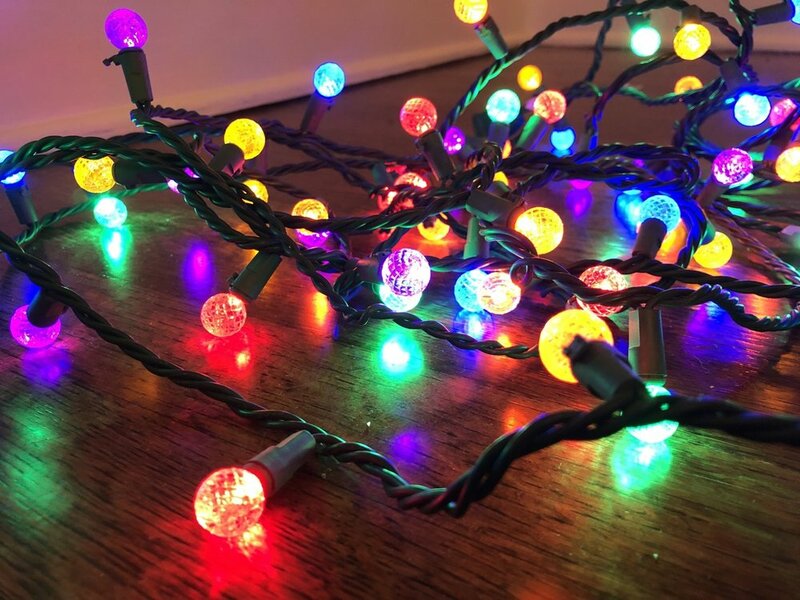 At my ‘Mamaw Delk’s house, every Christmas Eve would consist of a very large family crammed in a small house that was filled with presents, the smell of Gumbo and a single strand of colored Christmas lights that ran from one side of the wall, on the ceiling and down the other side of the wall. I regret never asking my Mamaw Delk why she did that. I always assumed it was just her thing to say “Its Christmas” but as I have gotten older and reflect on that single strand of lights, I like to think of it as the “entry way“ to her Christmas section of the living room. As for my Granny’s house (my mom’s mom) I loved setting up the very real – Christmas tree in the living room, with these small red bows and the single strands of Brite Star icicles that would make an absolute mess when cleaning up, but at the time, who cared. Along with the red bows and icicles, we also put red ornaments on the tree. I have no idea why, and looking back...it was so random – maybe it was because my mom was a teacher? I don’t know. Christmas morning was traditional with a huge lunch filled with turkey and dressing and then lots of presents to open. I am reminded often from my parents that I was very astute growing up making sure I had the same number of presents as my cousin Meredith. My Uncle Keith was the cameraman. When we have some family reunions, he pulls out the old videos and we get kick out of them – thanks Uncle Keith, they’re awesome. Reflecting on these memories it’s no surprise I am beginning my own traditions with my own family and we’ve adopted some great ones as time as gone on, and my parents are now the “grandparents” - but I think I'll save that info for a later blog. I’m not going to say it’s a ritual, and we haven’t been married that long, but my wife knows what goes down the Friday morning after Thanksgiving. Luckily for me, Thanksgiving came early this year so I can enjoy my ‘stuff’ an extra week. This year was a lot of fun as well, because my son Conrad is almost 3, loves the Grinch and is genuinely excited about Christmas, even though he really doesn’t know what it’s about. I woke Grayson and Conrad up this year and decided to go into a coaching monologue about how “I need their help” and “this year is going to be extra special, because we have a little girl we have to get ready for” and “don’t break any of my stuff” and “Conrad put your feet out of your brothers ear” and then it escalated from there. It ended with all hands in and a very loud “1,2,3..Merry CHRISTMAS!” The Christmas music began blaring through the house and I began the delicate and arduous task of bringing all the Christmas decoration bins down from the attic and putting up the Fall décor at the same time. I have three major focuses for my Holiday decorating. My collection of Nutcrackers, my Christmas Villages and our Christmas tree. It was the Bombay Company’s Christmas collection of 2007 that really got me into the collecting world of nutcrackers. Don’t' believe me – google it. It started with a huge Viking on a boat and has now gone from Wizard of Oz to the gingerbread man. I am not sure of the total number I have at the moment, but it grows by 2-3 each year. I have gotten strict on what is an acceptable Nutcracker to display too, I must confess...it’s got to have something “extra” to make the cut. My latest Nutcracker is an Irishman. This past year my wife and I did the ancestry.com thing and I discovered I'm 47.8% Irish. I’ve really enjoyed this new-found information. Every time I see ANYTHING that resembles ANYTHING Ireland/Irish/Green/Cloverish/leprechaun/Gold I point at it and say to Julie, “Hey, that’s my people.” So, when we were in the Christmas Place in Pigeon Forge and I had finished drooling over everything in the store, I spotted the Nutcracker that would be my purchase. I looked at Julie. She looked at me. I smirked. She began to roll her eyes. I began to speak, “Hey, that” "YOUR PEOPLE, I KNOW!” Julie cut me off. The Nutcracker is on our mantel. The Christmas village collecting also began in The Christmas Place in Pigeon Forge, TN. My family had gone up for Thanksgiving week and needless to say, my Christmas decor game blossomed. Now, the Christmas villages you may be used to seeing are very traditional, sort of the Christmas Carol – Charles Dickens style. Those are great, but not really my style. So, when I saw they had come out with A Christmas Story Christmas village...I went broke. I have since grown my Christmas Village collection to include (My favorite Christmas Movie) National Lampoon’s Christmas Vacation – complete with Cousin Eddie emptying his toilet, figurine. Along with my newly adopted Village – How the Grinch stole Christmas. Each year, I work to add a small piece here or there. It’s become quite the obsession, err, I mean...hobby. Some of you may be wondering, “Where is Julie? Doesn’t she decorate?” The answer is absolutely! She tackles the mantle and the dining room. Currently, the dining room has a container on it full of Christmas décor that hasn’t been removed yet...(I tell myself, pick your battles Russell, she’s like 56 weeks pregnant right now...). The mantel looks great though! She also supports me and knows I absolutely love this time of year, so I'll take that any day of the week/month/year. Gentleman, you may read this and say, “I’m not going to do any of this, its ‘feminine’ or perhaps you’re just a grinch in general and do not appreciate the Holidays. I have a message for you – get over yourself. This is an opportunity for you to show your kids, your wife or whomever that it’s perfectly normal and fine to enjoy Christmas, to be a kid again and not care about what others think of you. Here’s a thought, actually care about the memories you make with your own family. Guess what, the deer will still be in the woods when you’re done. The fish will still be in the pond, and if you do this early, you can watch football at noon. Now, don’t get me wrong – I realize it’s a choice. Many of you may seem unsure of where to put a certain item, or what looks better here or there – tip, ask your wife. Treat it as a shared activity. Who knows, you might even enjoy it. So, I challenge each of you...be a man, decorate for Christmas.